The easiest email photo software available anywhere. Easily email photos with Photolightning's unique HTML email capabilities — No more attachments when you email a photo! Do the people you email photos to have trouble opening attachments? If so, you need Photolightning. Imagine being able to send an email containing beautiful photos to friends and family in just 2-4 seconds per photo! That's 15 to 30 photos per minute. Imagine having the photos placed right into the body of the email (no attachments) along with any captions you have set and the date of the photo  in seconds. Imagine no more. Photolightning automatically reduces your photos then places them right into the body of your email. No more attachments for your friends and family to open. No more waiting to send (and receive) your photos. No more time wasted reducing your photos before you email them. Our goal was to make it possible for you to download 24 photos from your camera, select the photos you want to email, and press Send in your email software - all in less than 5 minutes from the time polo ralph lauren italia you plug in your camera. If you want to email photos to friends and family with no hassles in the least time possible, you owe it to yourself to try Photolightning. With Photolightning, you can easily place your photos onto beautiful graphical backgrounds* in just two clicks. The screenshots below show a few of the included email templates. Email one photo or a complete set of photos (from camera or disk) in as few as five clicks. Automatically reduces your photos down to 50Kb per photo (or send them full size if you wish to). Send photos without using attachments (*Outlook and Outlook Express only). 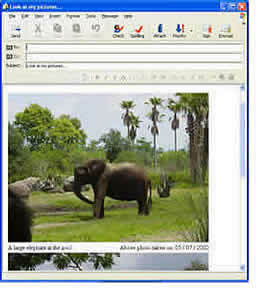 Automatically place captions and photo date/time into email along with photo(s) (Outlook and Outlook Express only). Send HTML photo emails with beautiful backgrounds. Optional: Send photos as attachments. Optional: Compress all photos into a ZIP archive before sending. Works with all popular email software and services including Outlook, Outlook Express, AOL, Netscape, Yahoo, and Hotmail. Download Photolightning and try it today! You won't find easier to use photo email software anywhere. Take the guided tour of Photolightning. "Photolightning ... turns the often-tedious process of downloading, sharing and printing photos into a quick series of one or two-click steps." Order online using our secure servers, or via purchase order, fax, phone, check, or wire transfer. We accept VISA, MasterCard, American Express, and Discover.